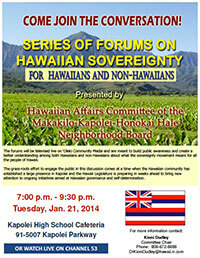 The first of the “Sovereignty Conversation: Community Forums” (the forum on January 21, 2014 at Kapolei High School) is now available to watch on-demand. There are two options: YouTube and ‘Ōlelo Community Media. The most complete version is on YouTube and includes the beginning of the presentation. Thank you to Pono Kealoha for filming and posting to his YouTube channel. We kick off the “Sovereignty Conversation: Community Forums” on Tuesday, January 21 with a fascinating review of history. Presenters will be Jon Osorio (professor at UH Manoa and well-known recording artist), Palani Vaughan (who will add to his talk with three songs sung with his recording group, the King’s Own), and Poka Laenui, attorney and longtime sovereignty leader. Bringing together views from all sides, a panel will then comment on the topics that have been discussed. 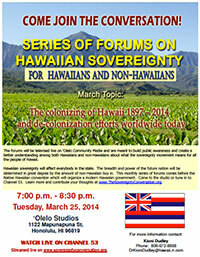 The panel will include OHA Trustee Peter Apo, Major General (Ret.) Butch Correa, Professor Genai Keliikuli from LCC Wai’anae, and Dr. Kioni Dudley. The emcee will be Mehana Hind. 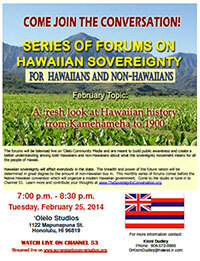 Tuesday, January 21, 7-9:30 p.m.
Also live on ‘Ōlelo channel 53. Please plan to attend and tell your friends.